Donald M. Tinsley, Sr. is a veteran community advocate—well-known in and outside of Indiana’s Deaf community. He’s a quiet kind of leader, not given to talking about his own accomplishments. Since 1995, he been Program Director of Indiana Deaf and Hard of Hearing Services (DHHS). He has served on the Culture Inclusion Committee for the Governor’s Planning Council for People with Disabilities (GCPD from 1993 to 1998, and chaired of the Relay Indiana Consumer Advisory Committee. He graduated from GCPD’s Partners in Policymaking Academy (PIP) in 1994. He founded the Indianapolis chapter of National Black Deaf Advocates (NBDA)—Indianapolis Black Deaf Advocates—and served as its first president from 1994 to 1996. He chaired NBDA’s 16th Biennial Conference in Indianapolis. From 1999 to 2002, he served as NBDA’s Treasurer. When Sprint opened Relay Indiana in 1993, Tinsley served on the Consumer Advisory Committee (RICAC) for the Indiana Telephone Relay Access Corporation (InTRAC) from 1993 to 1997, and chaired RICAC from 1995 to 1997. He was elected vice president of the Indiana Association of the Deaf (IAD) in 1999. In April 2003, he made history at the IAD’s biennial conference, when he was elected its first Black president; he served for two years. Currently, he is a member of IAD’s Board of Directors. He continues to volunteer for his community. In 2005, he was recognized by NBDA for his accomplishments. He also received the NAD’s 2006 Robert Greenmun Award for his excellence in leadership and contributions to the IAD. He and his wife Gloria, an alumna of Tennessee School for the Deaf, have two grown hearing children: Don Jr., a branch manager for Rent-A-Center in Indianapolis, and Rebecca, who earned her doctorate in Biochemistry in 2006 from University of Michigan, and works at Colgate-Palmolive in New Jersey. Don and Gloria also have two grandchildren: Destiny, 12, and Donald Tinsley III, 7. 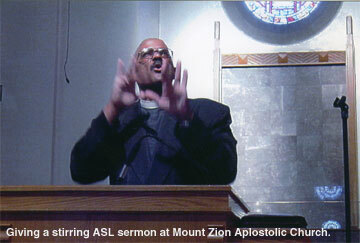 In the secular sphere, he has given numerous presentations on Deaf and Black Deaf Culture, Black Deaf History, the ADA, and Deaf Leadership training. Recently, he conducted an illuminating and enjoyable workshop on anti-discrimination legislation at the Pre-Conference Institute of the First National Deaf People of Color Conference in Indianapolis.